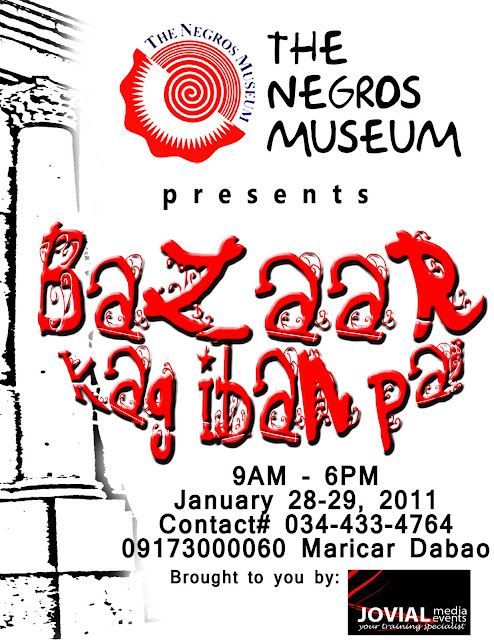 Negros Museum: BAZAAR kag Iban pa! The Negros Museum with Jovial Media Events invite you to come, join and visit us in our Bazaar on January 28-29, 2011 from 9am to 7pm at the museum lobby. The Negros Museum has partnered with Jovial Media Events to organize a Bazaar and etc. to be held every last Friday and last Saturday of the month starting January, 2011. Selling food, clothes, shoes, clothes, fashion accessories or novelty items. Looking for new finds in gourmet food. Interested foodies and anyone who want to get their products across are all welcome to set up their stalls. Space is at P300 per day. This is in support of the museum’s fundraisers and also to encourage everyone, especially the balikbayans, our local residents and students to come and see our local museum. A training workshop on General Housekeeping will be conducted at 2pm on Jan. 28, 2011 by Ms. Myrna P. Castillo. Watch out for our announcements for more activities during the event. For inquiries, contact 7081462 or 09173000060.